We’re on the cusp of 100 years of business at Bernick’s. We’ve been doing this long enough to know it’s not just about the beverages. There’s a difference here. Our culture. Our product. Our customers. As you contemplate installing a micro market within your organization, we encourage you to consider ours for our three unique differences. Our company was founded around principles that kept people at the center of our mission, vision, and values. We don’t sell to you, we partner with you. When you take away the pressure and demands of meeting a quota, the byproduct is meeting expectations: yours. Every customer interaction is a positive experience with flexible, proactive, can-do attitudes. We genuinely become invested in your goals, successes, and people. It’s hard not to develop that relationship and establish rapport when we feel like a part of it - the customer's business. Our micro markets are no different. Because we’re such believers in what they can offer to you and your employees, we install them at no charge. There’s no catch. We ask for space, Internet, and electricity and we do all the rest. We manage your inventory, perform maintenance, and monitor security systems to make sure that when we tell you we’ll give you unrivaled service, we mean it. The best brands cannot create loyalty. It has to come organically, driven by people who promote the best brands. We can honestly say we have both. We proudly distribute some of the nation’s very best brands, and the people who deliver those products are the nation’s very best – not that we’re biased. 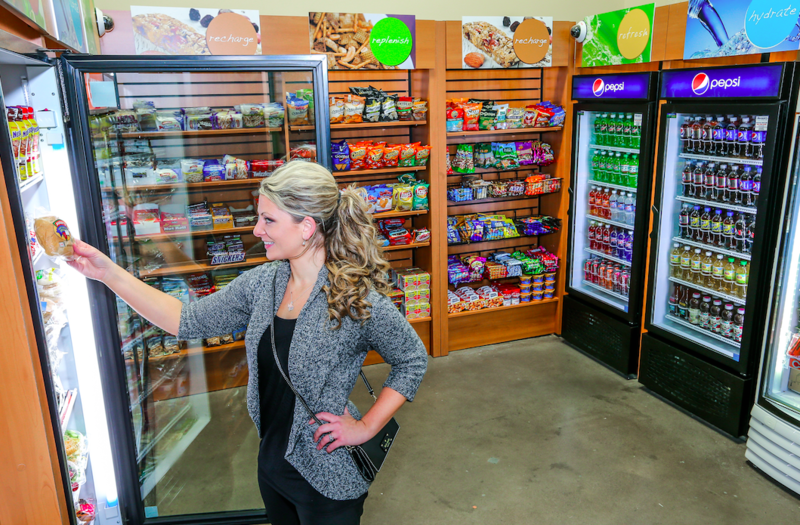 Our micro markets can provide nearly 400 products including snacks, beverages, fresh food, and sundries. We know you want your employees to have options plus convenience. Brands like Pepsi, Starbucks, Naked Juice, Fiji, Amp, Izze, Sabra, Frito Lay, Famous Amos, and Mars have loyal customer bases, and we’re able to stock your micro market shelves with such products. And for those of you, like us, who are committed to keeping things local, micro markets can be stocked with fresh, seasonal produce as well. We pride ourselves in staying up on trends, and always look to bring bigger, better, and more to our customers all of the time. You might not expect community involvement to be a reason to partner with Bernick’s on your micro market, but it’s probably the most important reason. Healthy communities mean healthy companies and healthy companies mean healthy communities. It’s a beautiful, endless system. We live here, and we work here too. If we can help you to make a difference within your company, boost your employees’ morale, or impact the culture, we want to do it. Bernick’s donates 5% of net income to the communities that we serve each year. We’re lucky enough to be doing what we love, but also know we wouldn’t be able to do so without the support and partnerships we have. Giving back is one way we acknowledge that. A new study from the Society of Human Resource Management showed 72% of employees rank “respectful treatment of all employees at all levels” to be the most important factor in job satisfaction. Treating people like people … it really is that simple. Let us help you with a micro market.